A local resident, Christopher understands a community spirit and he takes pride in sharing the benefits of Osteopathy and general health maintenance amongst the community. He positively encourages people to share a view that an individual should endeavor to control their health rather than letting their health control them. This enthusiastic approach has always proved to be effective for his patients. Having respect for both the medical and complementary therapy fields, Christopher receives great satisfaction from developing a treatment plan tailored to the individual. Being actively involved in local swimming and cycling clubs as well as his keen interest in human anatomy and physiology, he understands the demands placed upon the body in times of injury. From the everyday office worker to the elite athlete, Christopher has had experience dealing with many people and their differing lifestyles. As a health care practitioner he takes pride in dealing with what is a persons greatest asset, their health, and to have a positive impact on ones health is for him forever satisfying. 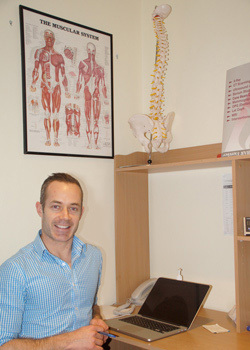 Christopher is very pleased to be a part of the team at The Osteopaths, where we offer Osteopathic care to the whole family in a relaxing and caring environment. Please feel free to contact Christopher to discuss whether Osteopathy may be beneficial to you, your family or friends.